We’ve all been there. You’re happily cruising the internet for recipes to make for dinner this week, and you land on a dish that sounds great and has beautiful pictures. Total winner, right? But then you scroll down to the recipe, and you cringe at the list of dozens and dozens of ingredients. Ain’t nobody got time for that. Yes, sometimes it’s fun to dive head-first into a complicated recipe, but for the vast majority of meeting-packed, errand-running, to-do-list-as-long-as-your-arm days, simple eats are where it’s at. Take these five new veggie side dishes: Aside from four “freebies” (water, olive oil, salt and black pepper) each of these recipes clocks in at a wimpy three ingredients. How’s that for simple? Manchego is a tangy, semi-hard cheese that is similar to Parmesan, but with a milder flavor. It pairs wonderfully with the firm, tart apples that are in season right now. This would be great served with pork chops for a not-too-heavy comfort food dinner. Step aside pumpkin—you might rule morning lattes and desserts this season, but butternut squash is where it’s at for easy, tasty fall side dishes. So packed full of flavor and sweetness, all butternut squash needs to taste amazing is a quick trip in the oven and a sprinkle of fresh rosemary. If you think you don’t like cooked carrots, think again. These carrots—cooked al dente so there isn’t even a hint of mushiness, and dressed in a slightly rich, slightly sweet coconut oil and honey glaze—will make you change your carrot-doubting tune. Browning butter makes a dish sound fancy, but it’s actually super easy. It only takes about five minutes, and adds so much nutty, rich flavor to these green beans. Make sure to not overcook your green beans—this dish tastes best when beans still have a little crunch in them. 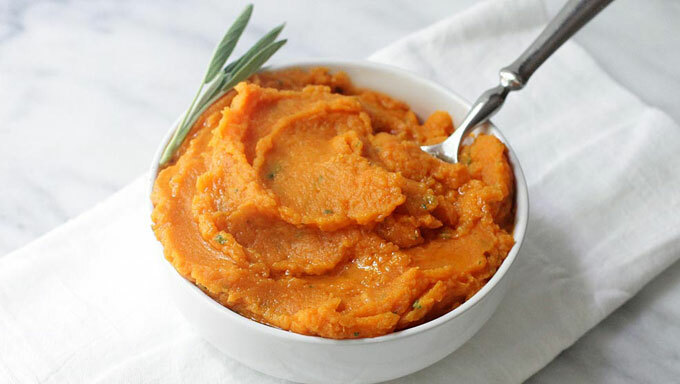 Whether you’re following a non-dairy diet yourself or just want to provide menu options for your vegan or lactose-intolerant friends, these dairy-free mashed sweet potatoes are perfect for your menu. Olive oil makes the sweet potatoes creamy without cream, and the fresh sage adds a burst of autumnal flavor.